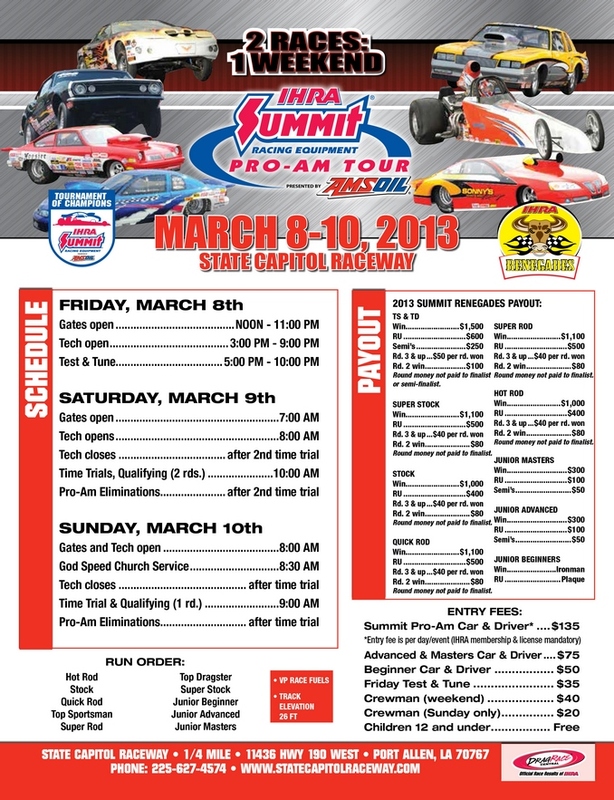 The 2013 IHRA Summit Racing Equipment Pro-Am Tour presented by AMSOIL Division 4 season kicks off March 8-10 at State Capitol Raceway in Baton Rouge. Always one of the toughest divisions in the country, the 1/4 mile showdown will feature a double Pro-Am points meet with a test and tune on Friday and qualifying and racing on Saturday and Sunday. WHAT TO EXPECT: The first of the four Division 4 double Pro-Am events will be held at State Capital Raceway on March 8-10. Friday gates will be open from noon until 11 p.m. for parking. Tech will run from 3-9 p.m. 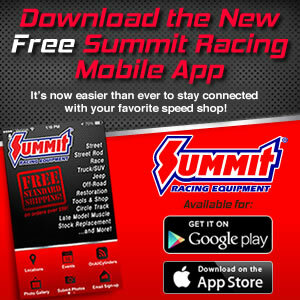 There will be a test and tune from 5-10 p.m. for $35 for those interested in participating. Saturday, the gates will open at 7 a.m. and tech will open at 8 a.m. and close after the second time trial/ qualifying session, eliminations immediately following the second time trial. Sunday morning gates will open at 8 a.m., God Speed chapel service at 8:30 a.m. and one time trial beginning at 9 a.m. (time and weather permitting) followed by the second Pro-Am of the weekend. Run order for the event: Hot Rod, Stock, Quick Rod, Top Sportsman, Super Rod, Top Dragster, Super Stock, Junior Beginner, Junior Advance, and Junior Masters. RACER MEAL: There will be a meal for racers following the completion of Saturday’s Pro-Am race. State Capitol Raceway’s own house chef will be cooking up all kinds of Louisiana specialties including his favorite – deep south gumbo. You can’t miss this one-of-a-kind meal! FAST FACTS: The IHRA has traveled to State Capitol Raceway in Baton Rouge every year since 2009…in 2012 both David Latino and Bart Nelson doubled up in Super Stock and Hot Rod respectively, while Shannon Brinkley took the win in two different categories (Quick Rod & Super Rod)…the winningest drivers at State Capitol Raceway since 2009 in national event and Pro-Am competition are Slate Cummings, Glenn Wright, Joe Teuton and David Latino all with three wins apiece…go ahead and plan on a Hidalgo visiting victory lane in Baton Rouge as the father and son duo of Jimmys have visited 8 finals in the last three years at State Capitol Raceway with Junior winning twice and Senior once…Chris Gulitti won at State Capitol in Top Sportsman in 2009 and then again in 2012 and has begun 2013 with a win already, watch out…Glenn Wright has won at least once at SCR in each of the past three seasons.